Devils Backbone Brewing Co. with Coronado Brewing Co. Dark brown in color with deep garnet highlights and an off-white head, while it lasts. As I sniff, notes of pine tree and orange rind co-mingle with lightly toasted rye bread and the slightest hint of freshly picked mint leaves. The flavors are bright and the carbonation is medium, which really allows the orange zest move to the front with the resinous pine taking a backseat. It boasts a middle of the road bitterness with a dry finish to match. Great example of the style. 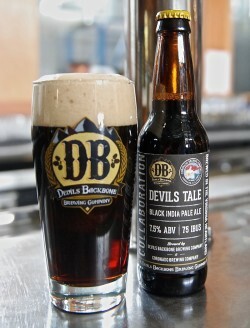 This is one of four beers included in the Devils Backbone Adventure Pack. Click here to read tasting notes on each of the beers.